I thought it would be interesting to have stripes in the warp. I noticed that in my thread supply there were a lot of shades of purple so I created a palette of purples. I really liked the warp when I pulled it off the warping board, but as I started weaving, I didn't like what I was getting. My husband walked in and said that he noticed there was a phase in my process when I would doubt my choices and get discouraged but then later I would love what I created. I think he is right. So I kept trying different weft threads until I came up with a group that looked harmonious. Then I thought to add some sakiori cloth strips and that really made it special. The sakori strips were cut from an old African printed tie-dye tablecloth that my friends Beth and Jordan Holtam brought back from one of their trips. I had used it as a tablecloth for years but lately it had been pilling after each washing so I stopped using it. By cutting it in very small strips, I figure the pilling would be minimal. I saved some of the round circles from the cloth that I can use as accent pieces on whatever garment comes from this fabric. I had planned to use the same colors in the warp as for the weft. I envisioned how it would look to have squares of solid colors where the weft and warp crossed. It came out like I expected but it was boring just using the same colors so I added other colors and textures plus the Sakiori strips to come up with a really interesting cloth that I am looking forward to wearing. I felt hopeful about my color choices when I saw the warp just off the board. 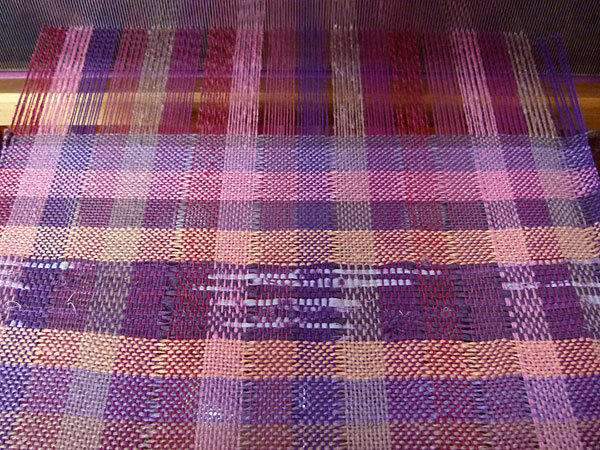 The warp on the loom with the colors starting to come together and the Sakiori strips adding some magic. This is the fabric just off the loom. I am pleased with the results. It could have come out looking traditional with the plaid design but it is far from traditional now. I did not count my weft but just eyeballed it so that it would be a natural fit of colors. I see colors as the actors in the play. The come on and off stage and it varies depending on how much emphasis I want to give one player over the other. I suppose only weavers will understand that or maybe that is just my way of making sense of design.